You know what's a great idea? 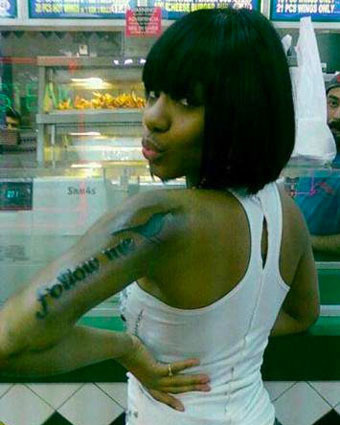 Permanently declaring your love for a social networking site with a tattoo. Because the online landscape definitely DOES NOT change over time. Certainly Twitter will always be the top social networking site. Just like Friendster and MySpace before it. That tattoo will be just as relevant in 20 years as it is now. Good call, crazy lady. As Best Week Ever points out, the tattoo also is pointless, as she doesn't even have her username on there. Good call again, crazy lady.